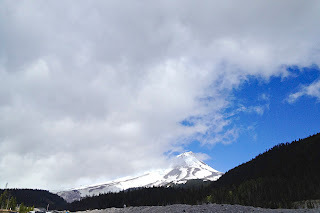 The Mt Hood Scramble is one of those races you overhear people talk about and think, Why would anyone do that? We had talked about doing it for years, but no one was ever quite crazy enough to register. Or if we tried, we were saved from our own craziness by the race already being full. Well this year, our luck changed. Bob, Gretchen, Kevin, Ann and I-- and a few others who, unfortunately, didn't end up running-- registered early and formed Team Beer Pressure. The race started and ended in the parking lot of White River Snopark, which also served as post-race party central. From there, the course climbed gritty, volcanic ridges and rocky riverbanks; crossed White River's crotch-deep, raging, frigid flow six or eight times; scaled two waterfalls; dipped through countless dry and wet streambeds; scurried across about a third of a mile of snowbanks; balanced across a number of fallen trees; and hurtled through dense forest undergrowth. Oh, and there were a few muddy spots. At one point I rolled my ankle, but with the next river crossing-- or "on-course ice bath" as I liked to call it-- it was nicely numbed. Each time we crossed the river, and at other especially challenging spots on the course, I was impressed with how everyone helped each other. You could always count on the person in front of or behind you to lend a hand. That really made the race special. Without a doubt, this was the craziest run I've ever done. During the race, we kept thinking that instead of the advertised 10k distance, we were running closer to 13 miles. That turned out to be because it took us nearly two hours. In fact, it was just under 10k-- the course was just so insane, so challenging, that we lost track of direction and sometimes could barely find the next flag marking the direction of the course. After the run, we enjoyed a beer in the parking lot, then went to Ratskeller in Government Camp for burgers and another celebratory beer. We rehashed the highlights of our runs and caught up with each other. It was a great time and I, for one, am eager to do it again!